How would you like a phone call at nine in the evening from friends that you haven't seen in 16 years? Wanting to meet you the very next day? Well that is just what I did. They said "YES". Sixteen years ago my family left sunny California for Raleigh, NC. At that time many families were leaving California to many different states for lots of different reasons. 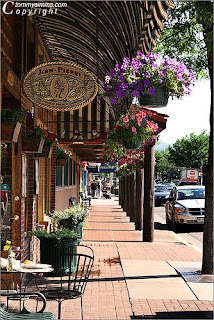 Two friends of ours moved to Durango, Colorado. We tried to stay in touch, but you know how that goes. You get busy with kids and all that great stuff that goes along with raising a family. We met today at the Double Tree Hotel in Durango, Colorado for lunch. What a wonderful day it was. Catching up on all that we've done, how we all raised our kids and even comparing who had the most gray hair. (It was a tie). 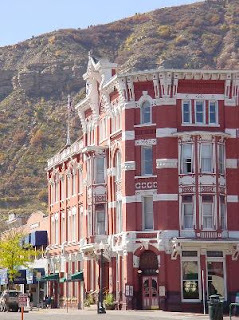 Durango is the sweetest, little western town full of charm and great mountain crisp air. It is also full of warm and friendly people such as our friends. Hopefully we won't wait another 16 years for the next visit. 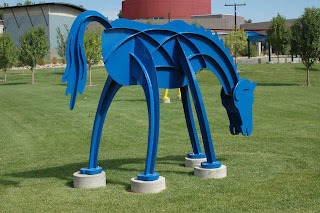 Tomorrow it's off to check out the quilt shops in Farmington. There is a Quilt Shop Here!!! There is a Bernina store and The Patchwork Pig too!! I guess I will check out these two places while hubby is in his workshop. 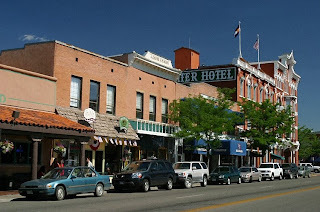 Patchwork Pig, LLC is located in the heart of the Four Corners (where Arizona, Colorado, New Mexico and Utah meet.) A day trip can take you to Mesa Verde, Durango Mountain Ski Resort, Fly Fishing in the San Juans, exploring Aztec Ruins, visiting Bisti Badlands, mountain biking Moab or being awe struck at the Grand Canyon. 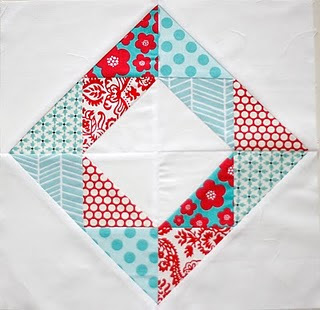 I just want to see some fabric and quilts. Maybe I can go fly fishing too!!! Or river rafting!!! Sunday was a travel day for my husband and I. We fly into Albuquerque, New Mexico. Hopped into our rental car and drove 3 hours to Farmington, New Mexico. This year I am tagging along with my husband while he attends the Southwest Chemistry Workshop. It is being hosted in Farmington, NM. There is not a whole lot to do here. I better check out the yellow pages. He also "makes" on my new carpet. Isn't he sweet? Well my kids are leaving the nest and now starting to make their own. 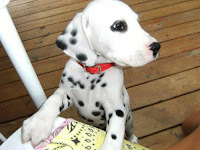 My lovely daughter decided that she needed a dalmatian puppy. After a lengthy search, she found a wonderful breeder very close to home and ordered her sweet little puppy. Waiting a few weeks for the puppy to be ready to leave his momma she says was worth the wait. His name is Apollo. The Sun god, who brings life-giving heat and light to Earth. He is 8 weeks old. This will be the first night in his new surroundings. Her brand-new apartment! I bet she'll get a great night sleep tonight. She brought him over for my husband and I to see. I fell in love with him instantly. 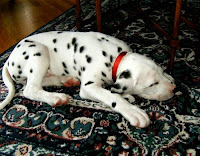 He already initiated the carpet, so that will be the last time he is invited inside. As soon as she took the dog out of the car, I just loved that cute little red collar. 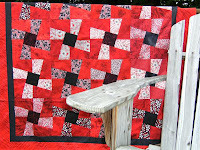 It reminded me of a wonderful red and black Twisted Sister quilt that I made. I thought I'd blog about both and show off my pictures.